As in many countries, Brazilians often joke that one should never discuss politics or football in mixed company. The potential for conflict and/or hurt feelings is simply too great. Yet in June of 2013, something amazing began to happen in Brazil: football and politics seemed the only two issues anyone wanted to discuss, and incredibly, nearly everyone seemed to agree with one another. Protestors in Fortaleza. Priscila Dantas. In the days leading up to the Confederations Cup – the main appetizer for next year’s FIFA World Cup – university students in São Paulo began to organize around increasing public transportation costs. The questions they raised were myriad, but in the most basic since they asked why bus and metro fares should be going up when the quality of bus and metro service was going down? They mobilized in protest on the eve of the Confederations Cup, and very quickly they found themselves brutally confronted by Military Police officers. When images of peaceful student protestors attacked by rubber bullets and pepper spray went viral, the ranks of demonstrators in São Paulo began to swell. 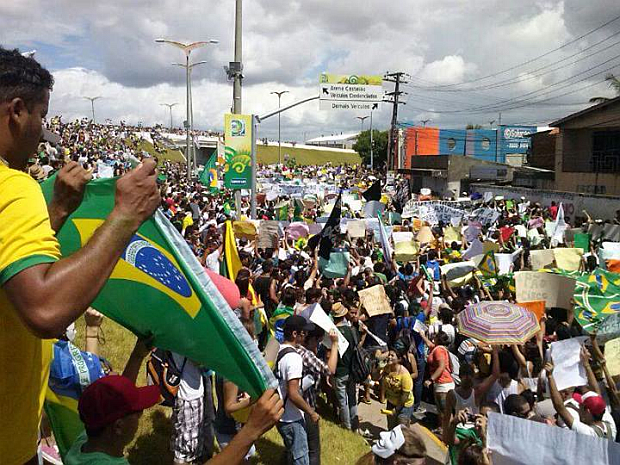 And very soon thereafter protesters mobilized in every other major Brazilian city. That public transportation issues lit the fuse of what’s been burning since the beginning of June is perhaps not surprising: bus and metro service in Brazil’s major cities has grown increasingly crowded, unreliable, dangerous, and expensive in recent years. And it’s something that affects millions of people on a daily basis. So when students took to the streets in protest over these issues – and were battered by police for it – nearly everyone in the country sided with the protestors. This wasn’t a special interest group pushing their own agenda; these were courageous individuals speaking out on behalf of the urban multitude. And to be sure, public transportation is by no means the only issue that has brought people together: since the beginning of June, people all over Brazil have taken to the streets for a host of different reasons, many related to the misuse of public funds, political corruption, and the country’s misguided development priorities. What international news media outlets have largely failed to recognize, however, is the broad spectrum of demands that unites this wave of Brazilian protesters. Unlike in past national demonstrations (e.g., the Direitas Já! movement at the end of the military dictatorship in 1984 or the impeachment of President Fernando Collar in 1992), there has been no singular, easily addressable issue raised by these protests. Rather than mobilizing around one, immediate common demand, people have come together to address dozens of very significant, structural issues. Political parties and labor unions have been publically sidelined, and rather than directing their complaints towards a singular political leader or faction, protestors appear united in their dissatisfaction with how Brazil has been managed at nearly every administrative level. So what is it, then, that brought millions of people into the streets, every single night, in cities large and small all over Brazil, for the better part of June? As the protestors themselves made clear, it’s about much more than just public transportation. Recurring demands include better public education and university opportunities, improved healthcare services, public security, putting an end to (or at least diminishing) political corruption, and better use of public funds. Many Brazilians are appalled by how much public money has been spent preparing for the World Cup while basic urban infrastructural problems continue to grow worse everyday. Who wants to live in country, they ask, that has first-world football stadiums and third-world hospitals, schools, and sewage facilities? Where FIFA sets the agenda and local people are mostly ignored? Taxes are in fact quite high in Brazil, yet the returns that people see are insulting. And at the root of this problem, as everyone in Brazil knows, lies a long history of corruption, legal loopholes, and impunity for business and political elites. Inflation and high costs of living are also concerning to many, and just like nearly every other political leader, President Dilma Rousseff’s approval rating has plummeted in the last few weeks. People have come together, in the streets, online, and around television sets, and they’ve found that they share many of the same frustrations and concerns. Support for the protests has been almost universal in Brazil – excluding, of course, small groups of vandals that garner disproportionate media attention – and politicians are now finding they must address the demands of an engaged citizenry. As journalists and some academics have recently pointed out, this wave of protests in Brazil, Turkey, and countries elsewhere comes from a growing middle class that expects higher levels of accountability and democratic transparency. This expanding base of people feel they uphold their civic responsibilities – paying taxes, buying homes, investing in education, starting families, voting, following legal protocol, reporting unattended luggage, and so on – and in return, they expect political leaders to follow suit. And needless to say, they’re nonplussed with what they’ve seen from politicians. To a certain extent, this is very much what’s behind mass mobilizations in Brazil. But there are other, perhaps more nuanced reasons for why the Brazilian multitude should erupt at just this moment. To begin, the domestic economy has been growing, modestly but consistently, for nearly a decade now. And urban Brazilians in particular are no longer so willing to accept the narrative that they live in a poor country that should suffer so many ‘developing world’ problems. Coupled with this are economies in North America and Europe that continue to flounder, and Brazilian politicians are finding it increasingly difficult to blame so many of the country’s infrastructural woes on wealthy foreign profiteers. Yes, many Brazilians recognize, neocolonial interests are harmful to Brazil’s long-term development goals, but equally corrosive can be a domestic culture of political corruption and negligence. In just a few short weeks since people took to the streets, protestors have already made significant gains. Many cities have frozen or even reduced bus and metro fares, and PEC-37, the constitutional amendment that would have prevented the Public Ministry from investigating cases of corruption and crime (thereby providing politicians and police even greater levels of impunity), met a very public defeat in the Brazilian congress. People are feeling increasingly empowered, and while this round of protests is likely to fade at the draw of the Confederations Cup, it’s safe to expect that the streets will fill again this time next year, perhaps with even more people, as the World Cup kicks off. The multitude is growing in Brazil, people are becoming better connected and well informed, and until some profound changes have been addressed, demonstrators are unlikely to pass on the international platform provided by upcoming mega events (the 2014 World Cup and the 2016 Summer Olympics). While rivalries between different football clubs in Brazil can spark bitter debates, one thing that draws nearly everyone together is support for the national team. And throughout the month of June, as the Brazilian football team thrived in the Confederations Cup, protestors made it clear that their message was by no means anti-Brazil (or even anti-football). Rather, it was unquestionably patriotic: there is incredible love for this country, and those in the streets believe that Brazilian public education, healthcare, and democracy should be every bit as admirable as the national football team. It’s a message that’s brought millions of people together, in conversations about politics and football, and it’s sparked a growing sense of passion and excitement. June of 2013 will not be a month that is soon forgotten in Brazil: the team kept winning on the pitch, the people kept winning in the streets, and now, on the eve of the World Cup, there is cautious optimism about the future. This is an incredible time for Brazil, and people will be reticent to let this momentum slip away.